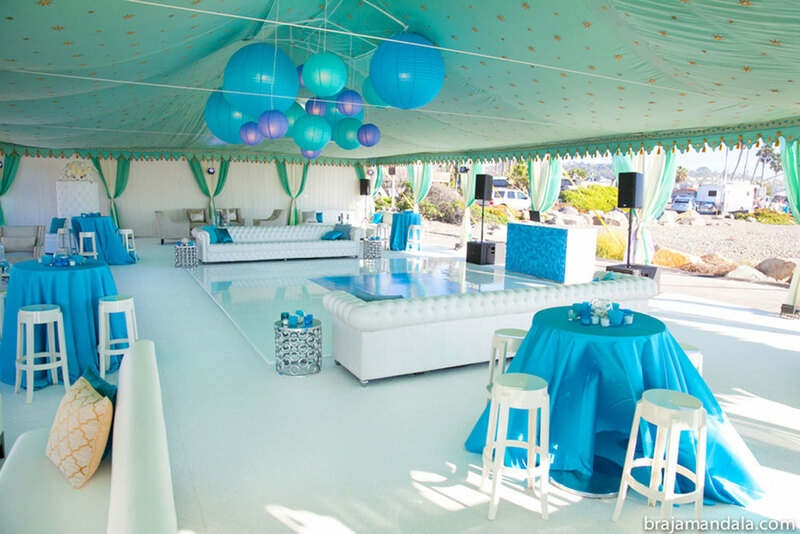 We are happy to be able to offer the Beach Chic range of Pergolas and Pavilions to our valued clients who have been asking for tents that are both elegant and laid back for poolside and beach entertaining. ‘Being based in Southern California was the main motivation, with so many marvelous properties and beaches calling out for luxury tents in a more casual theme’ says Dominic Mitchell, Raj Tents co-founder‘Of course our destination events were a big inspiration too as the collection invokes the elegant beach feel of the amazing resorts we work at’. The Beach Chic collection is all about relaxed eclecticism with warm white layered into aqua tones. Seashell chandeliers give the natural texture of nature to offset the blue hues evocative of the ocean’s tranquility. To keep the feel cool and simple, the Blue Wave valance is appliqué in sea-spray green, sky blue and white with a matching interior and aqua toned exterior. Many thanks to the fabulous Hotel Casa Del Mar in Santa Monica for allowing us to shoot the Beach Chic collection at their pool. Apart for being a fantastic hotel in a great location, the Casa Del Mar and her neighbor, Shutters on the Beach, share event planning and catering services giving a lot of flexibility to their corporate and weddings patrons whilst melding historic elegance, state of the art facilities and beach style. The Beach Chic Pergola overlooking the Ocean was shot at the Capella Pedregal in Cabo San Lucas where Raj Tents set up an extensive beach installation – watch out for some great pictures of the unique beach wedding coming up in one of the next posts. See more on our Beach Chic theme page.